A full decade of fun. THE TERM OF THE WARRANTY is the earlier to occur of ten (10) years from the Date of Original Purchase of the Covered Vehicle or the transfer of title of the Covered Vehicle to a subsequent owner. This warranty is wholly separate from and in addition to the Limited Warranty that comes with the new vehicle from Yamaha at no charge to the customer or Yamaha Extended Service (Y.E.S.) coverage purchased by the customer. 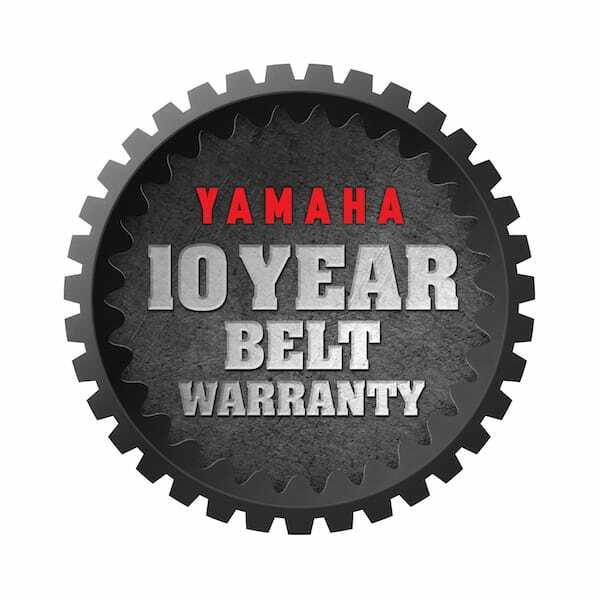 DURING THE TERM OF THIS WARRANT, any Yamaha Dealer authorized to sell and service the product in the continental United States will, free of charge, repair or replace, at Yamaha’s option and sole discretion, the V-belt, if adjudged defective by Yamaha due to faulty workmanship or material from the factory, as well as repair or replace, at Yamaha’s option and sole discretion, any other parts required as a result of the defective V-belt, provided the owner return the Covered Vehicle, with transportation prepaid, to the Yamaha dealer. The Covered Vehicle owner shall be responsible for all transportation, loss of time, inconvenience, travel expense, loss of use, towing, storage and other expenses incurred in returning the Covered Vehicle for warranty service. All parts replaced under warranty will become the property of Yamaha. YAMAHA’S LIABILITY under this 10-year limited warranty shall in no event exceed the actual cash value of the covered items and shall not exceed the Fair Market Value of the Covered Vehicle at the time of the covered repair, an amount equal to the private sale value of the Covered Vehicle on the date of a breakdown as set forth by N.A.D.A. (National Automobile Dealers Association) or some other similar listing of product values if a N.A.D.A. value was not available. THE TOTAL OF ALL CLAIMS PAID DURING THE TERM OF THE WARRANTY SHALL IN NO EVENT EXCEED THE PRICE THE CUSTOMER PAID FOR THE COVERED VEHICLE. CUSTOMER’S RESPONSIBILITY: Under the terms of this limited warranty, the original owner of the Covered Vehicle will be responsible for ensuring that the Covered Vehicle is properly operated, maintained, and stored as specified in the applicable Owner’s Manual. The owner of the Covered Vehicle shall give notice to an authorized Yamaha dealer of any and all apparent defects within ten (10) days of discovery and make the vehicle available for inspection and/or repairs. If requested, the owner of the covered vehicle must provide all service and purchase receipts as proof (receipts must be printed, not hand written, and specify clearly and unambiguously the Dealer name and address, date of service/purchase, showing all maintenance specified in the applicable Owner’s Manual has been performed. In the event of an apparent defect is discovered, protect the Covered Vehicle to prevent further damage (continued operation of the Covered Vehicle may result in damage that may not be covered by this limited warranty). 1. Improper use in an application other than that for which the manufacturer intended (as noted in the owner’s manual), including exceeding the vehicle’s maximum load and towing limits. 2. Rental, commercial, corporate, and business operation and use. 3. Competition or racing use. 4. Abnormal strain, neglect, or abuse, including clutch overheating and submersion in water or mud. 5. Damage due to ingestion of water, snow, dirt, or other contaminants into the V-belt case. 6. Lack of proper maintenance and storage of the Covered Vehicle as described in the Owner’s Manual. 7. Alteration, modification, or use of the Covered Vehicle not recommended by Yamaha, including use of “non-stock” or modified parts. 8. Cost of labor for replacement of a defective part or accessory (other than the V-belt). 9. Replacement or service of the V-belt for routine maintenance, normal wear and tear, or due, wholly or in part, to any cause other than faulty workmanship or material from the factory. 10. Parts covered by the Yamaha Limited Warranty on the vehicle or by Yamaha Extended Service (Y.E.S.) coverage, or by any pending legal proceeding, recall, or other service campaign. 11. Issues arising under any circumstances outside of the limited scope provided herein. 12. Claims that Yamaha believes in good faith to be the result of: collision or other accident; theft; vandalism; riot; explosion; earthquake; lightning, freezing; internal or external fire; water or flood damage (including prior flood damage); negligent, reckless, knowing or intentional damage; improper service or maintenance, manufacturer defect other than the V belt, improper installation of any part, fluid contamination (i.e. coolant, fuel, water or foreign material) or the failure to keep the motor and engine coolant at levels prescribed for the Covered Vehicle. 13. Customers located outside of the contiguous United States and Alaska. NO TRANSFER RIGHTS are provided under this Warranty. This V-Belt Limited Warranty is provided at no charge to the original registered owner and cannot be transferred to a subsequent owner. THIS IS NOT A SERVICE CONTRACT OR INSURANCE. YAMAHA MAKES NO OTHER WARRANTY OF ANY KIND, EXPRESSED OR IMPLIED. ALL IMPLIED WARRANTIES OF MERCHANTABILITY AND FITNESS FOR A PARTICULAR PURPOSE WHICH EXCEED THE OBLIGATIONS AND LIMITS STATED IN THIS WARRANTY ARE HEREBY DISCLAIMED BY YAMAHA AND EXCLUDED FROM THIS WARRANTY. SOME STATES DO NOT ALLOW LIMITATIONS ON HOW LONG AN IMPLIED WARRANTY LASTS, SO THE ABOVE LIMITATION MAY NOT APPLY TO YOU. THIS WARRANTY DOES NOT COVER ANY INCIDENTAL OR CONSEQUENTIAL DAMAGES INCLUDING LOSS OF USE, LOSS OF TIME, AND INCONVENIENCE. YAMAHA’S LIABILITY IS LIMITED TO REPAIRING OR REPLACING THE YAMAHA V-BELT AS PROVIDED IN THIS WARRANTY. SOME STATES DO NOT ALLOW THE EXCLUSION OR LIMITATION OF INCIDENTAL OR CONSEQUENTIAL DAMAGES, SO THE ABOVE EXCLUSION MAY NOT APPLY TO YOU. THIS DOCUMENT CONTAINS THE ENTIRE WARRANTY GIVEN BY YAMAHA AND THERE ARE NO TERMS, PROMISES, CONDITIONS OR WARRANTIES OTHER THAN THOSE CONTAINED HEREIN. NO ORAL OR WRITTEN INFORMATION OR ADVANCE GIVEN BY YAMAHA, ITS DEALERS, REPRESENTATIVES, AGENTS OR EMPLOYEES SHALL CREATE A WARRANTY BY YAMAHA OR IN ANY WAY INCREASE THE SCOPE OF THIS WARRANTY. REALize Your Adventure and view additional details and specifications on Yamaha’s complete lineup of Proven Off-Road vehicles online at YamahaOutdoors.com, or by visiting your local Yamaha dealer. Connect with Yamaha on your favorite social channels at Facebook.com/YamahaOutdoors, Twitter.com/YamahaOutdoors, and Instagram.com/YamahaOutdoors. Additionally find Yamaha Outdoors on YouTube, or search the following hashtags on all platforms: #Yamaha10YearBelt #WolverineX2 #WolverineX4 #Viking #YamahaGrizzly #YamahaKodiak #REALizeYourAdventure #ProvenOffRoad #AssembledinUSA #Yamaha.